Located in the heart of Paris’s most historic area, at one of the most iconic bridges of the city, Jeanne Danjou et Rousselet is a treasure trove of rare delights, an essential stop for those in search of unique vintage items of jewellery, and costume jewellery with old-fashioned charm and elegance. Between 1920 and the middle of the 1970s, Louis Rousselet was one of Paris’ most important jewellers, designing and making jewelry for the illustrious worlds of Fashion and Music Hall. Born in Paris’ Ménilmontant district, he was already an apprentice enameller at the age of 8 and went on to have his own workshops by 1920. At the height of his career, he had 800 people working exclusively for him. In the 1930s, Misstinguett – the great acting and singing star of the time – was the muse of Rousselet and his company. Many starlets such as Joséphine Baker often appeared in public wearing Rousselet beads in venues such as the Moulin Rouge and the casino de Paris. Chanel, Dior, Jeanne Lanvin, Jacques Fath, Maggy Rouf, Pierre Balmain, Elsa Schiaparelli, Balenciaga… all the Parisian fashion houses came to Rousselet for exclusive jewelry in the showroom situated at 2, rue de la Paix. There they could get their supply of pretty glass beads and chic embellishments for their creations. Plastron with Rousselet pearly glass beads, for Balenciaga. At the end of the 1960s, Louis Rousselet passed on the management of the workshops (with 80 employees) to his daughter, Denise. He also bought the store at the Pont-Neuf, where the jewelry could be presented to the public in a perfect setting. Today, Denise’s son Jean-Claude is in change of the boutique. 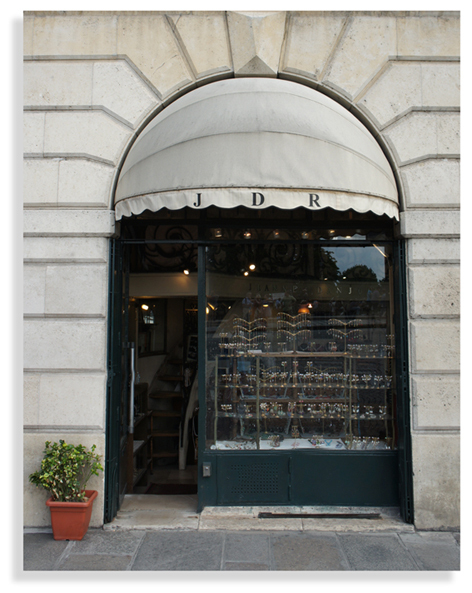 For more than 50 years, the Jeanne Danjou store has been a place that many Parisians know and love. Many big names in fashion and Film & TV come to the boutique to buy vintage necklaces, like Ines de la Frassange who mentions us in her book La Parisienne (see Press). Vintage fashion fans and bloggers can find antique jewelry and unique creations at an affordable price, which also serve as wonderful souvenirs of Paris for tourists from far and wide. Thanks to our history being intimately linked with clothing design and fashion, it’s impossible to ignore the Parisian chic and elegance of our jewelry, which is 100% Made in France. The expertise of the artisans who make these pieces guarantees the quality and uniqueness of our jewelry. 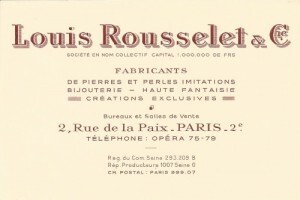 Louis Rousselet, designer of costume jewelry, managed one of France’s most important jewelry companies between the First and Second World Wars. He was also the President of the Bead Jewelry Makers Trade Union. Born in 1892 in Paris, he was an apprentice at the age of 8 in a jewelry workshop. In 1920, he registered his business activity under “Beads and Enamel”, working at 18 rue des Pavillons in Paris. He set up his own business in 1926. His premises at rue des Pavillons consisted of two workshops, a garden and manager’s room and he soon added another workshop in the suburbs. The second factory which was much bigger, could be found at 36-42 rue de la Justice in the Parisian district of Ménilmontant. 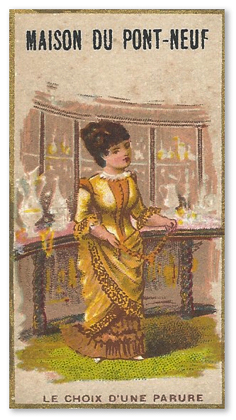 In his workshops, the technique of molten glass being worked by hand took place, also that of giving a pearly finish to beads. In a shop situated on the first floor of 2 rue de la Paix, the company received orders from wholesalers and reputable fashion designers. 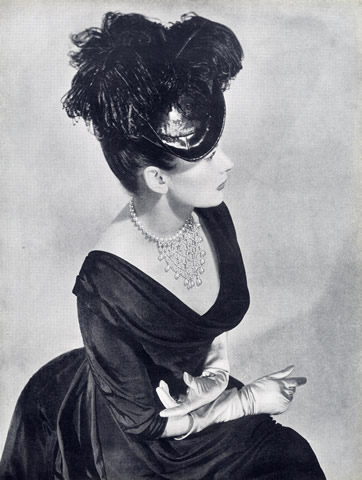 Between 1945 and 1975, Chanel, Jean Patou, Schiaparelli, Lanvin, Christian Dior, Jacques Fath, Robert Piguet, Balmain, Nina Ricci and others, bought items from the four collections created each year. In the 1920s and 30s, 80% of the production made by the company’s 800 workers was exported to North and South America, Australia and all over Europe. Rousselet created sets of jewelry for Music Hall, the Casino de Paris, les Folies Bergères and the Moulin Rouge. Mistinguett and Joséphine Baker lent their reputations to the company by making public appearances adorned with Rousselet jewelry. Pearly glass beads were the company’s biggest success, but so were all the manmade semi-precious stones such as turquoise. Beads made of galalith, using a process invented by Adolph Spitteler, were very much appreciated for their Art Deco patterns. The appetite for this didn’t stop until 1935 with the arrival of the vogue for bakelite. The Rousselet company made jewelry in great abundance… After the purchase of the Persan-Beaumont company, Rousselet made a new addition to an immense variety of colours and forms: metal work. All metal parts were all made by the company itself apart from a few. The refinement of fasteners, using a enamelling technique, and jewelry as delicate of a piece of lace, distinguished Rousselet jewelry. Putting together precious stones in a spiral shape on a metal support, to form a rose window form, also constituted a real signature of the company. 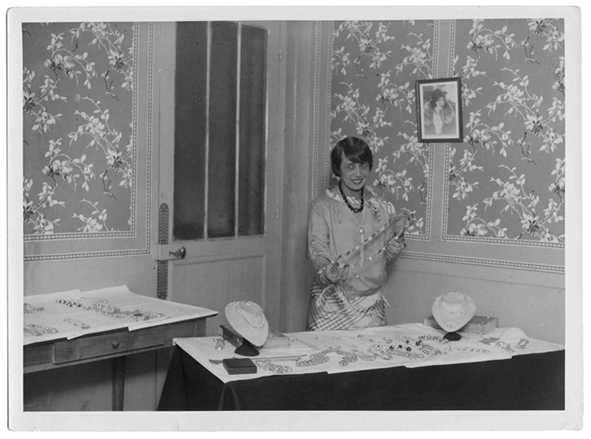 For Chanel, the Rousselet company made very recognisable jewelry using glass flowers in pastel colours, as well as strings of man-made pearls. (…).